Cyber Security Awareness Month - Day 5: Standards Body Soup, So many Flavors in the bowl. First I would like to say, without our readers and subscribers we would not exist and that we genuinely do read every post. A reader posted a request to break down standards bodies and I decided to take that endeavor on. This now has turned into a larger project than just one diary entry. You will see more on this topic but hopefully today is a good start. This first pass at understanding the different bodies does not include a complete list. Many of likely heard the quote “The problem with Standards is there are so many to choose from.” I really don’t know who first uttered that phrase UPDATE: Andrew S. Tanenbaum  but it holds true from my point of view. This article will take a 10,000 meter or 30,000 foot view (Depends on if you are metric  or imperial Units  ) of what I am calling standards body soup. Within this bowl of standards groups there are several types and methods in which they govern. I can make the assumption that most of the readers are familiar with a Request for Comments (RFC) and the group that governs this standards suite is the Internet Engineering Task Force (IETF). So, we will start there and will break down the IEFT into areas for understanding. This will provide a framework for a further list of Standards Bodies. Abbreviated Name: The short name or acronym used to reference the organization. Full Name: The complete name. Sometimes we only know the Acronym. Web Site: How to find them on the web. Members and Contributors: Who can and or are members of the standards group. Role: How do they influence or contribute to industry. Notable Standards: Standards that might matter to us. Members and Contributors: To Numerous to list. Membership is open to anyone and IETF is comprised of many working groups. A breakdown of working groups can be found at http://www.ietf.org/wg/ but in summary they are open to anyone and usually conduct business over open mailing lists. If there is an RFC that you would like to impact, join the mailing list and begin your journey. The IETF Is governed by a group called the Internet Society (ISOC) and the board of trusties can be found at http://www.internetsociety.org/who-we-are/board-trustees. With most standards bodies, in our experience, the members are made up from various places. Members will often have a second industry position and their parent company allows them to contribute. 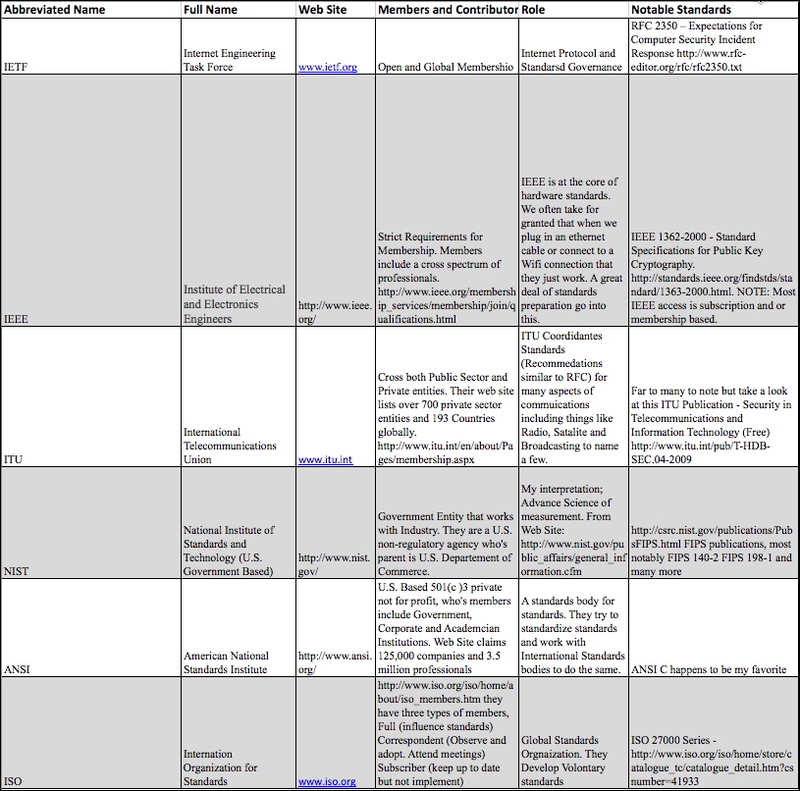 Notable Security Based Standards: Again there are far too many notable standards to list from IETF but I will list a couple of my favorites. In case you were wondering, yes there are standards for the standards. This is an informational RFC, which means it is not really a standard but a good reference. The title alone is scary but signs of a mobile world to come. This one is on my watch list. We have received a report of a large distributed SQL Injection Scan from a reader. Behavior of scan is being reported as 9000+ Unique IPv4 Addresses and sends 4-10 requests to lightly fuzz the form field. Then the next IP will lightly fuzz the second form field within the same page and the next IP the next form field. Looks to be targeting MSSQL and seeking version. The reader reports that this scan has been going on for several days. There does not seem to be a referrer page either. If you are seeing this activity and can report it please let us know. We previously featured our collection of Fake Tech Support Calls project. This scam is continuing and we are hearing more and more about these calls from both knowledgeable and unsuspecting users with varying levels of success or failure depending on your viewpoint. This week we feature the initial statistical reporting on the data we collected so far at https://isc.sans.edu/reportfakecallstats.html! More reporting and an API coming soon so stay tuned!